Last December, I watched the movie Julie and Julia which featured a young woman ("Julie") who decided to cook her way through Julia Child's "Mastering the Art of French Cooking". Julie blogged about her successes and failures, among other things, during the year--she named her project the Julie/Julia Project. But, it got me thinking...because I enjoy blogging...what could a person, in my field of wildlife ecology/management, do for a year as a blogging project? Well, maybe there are several things a person COULD do. You could select a different campground in Nebraska and camp out once each month (would be fun in the winter!). You could cook a different game recipe every week, following the tradition of the Julie/Julia Project. You could read an article every week from the Journal of Wildlife Management---that doesn't sound fun. Then, it hit me---Leopold's "A Sand County Almanac" is almost made for such an adventure. Aldo wrote it with monthly themes...perfectly made for a year-long adventure. Living in the paths of Leopold, the Father of Wildlife Management. For those unfamiliar, "A Sand County Almanac" was written by Aldo Leopold and published (posthumously) in 1949. The first section of the book is split into 12 sections---one adventure and reflection on his interaction with nature in Sand County, Wisconsin for each month. Hence, "almanac." The second section of the book is composed of several essays, including the concluding essay, "The Land Ethic." Obviously, that essay is this blog's foundation. So, I've got my direction. Once a month, I'll read the appropriate chapter and select some activity to either mimic or build upon a theme in the reading. And, I'll blog about my adventures. At some point, this might be fun to do with a class of students. And, anyone is welcome to play along. I'm NOT calling this "Larkin and Leopold" (although the alliteration is almost too good to pass up) because I think it's something anyone should be able to do! Of course, you may be noticing...it's March. And the year normally starts with January...so, I've got a bit of catch-up to do. 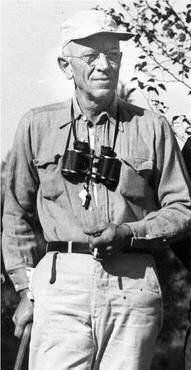 But, this should be fun---a forced, personal adventure with Aldo Leopold at my side. I try to read the Almanac about once a year - but usually all at once. I'll enjoy following your progress!